It just dawned on me that Hurricanes are a cocktail, but they don’t contain Tequila. The Hurricane cocktail contains enough rum that if you drink one you won’t care about the Hurricane and the next morning you will feel like you were hit by one. The first Atlantic Hurricane of the season may or may not be forming in the Tropical Atlantic. There must be a special language school for the weather forecasters that work on these storms. It’s making statements without really stating any facts. Danny is the name of the storm brewing – he has already been designated a Tropical Storm and might possibly turn into a Hurricane. However, the key however is there is a lot of dry Saharan sand and air floating around out there and we are in an El Nino weather pattern. 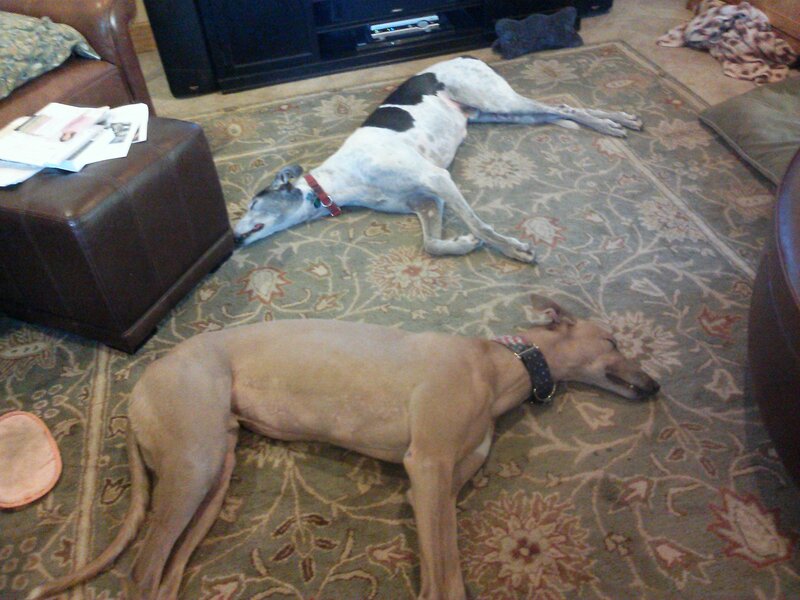 I could ask my Greyhounds for their storm predictions, but they are clearly too busy. So, we wait. To spare myself drama, I only read the Weather Underground. On to the tequila, I have discovered I have an Agave americana shooting up a bloom spike. I thought this was interesting as some of these are called Century Plants because they bloom every hundred years and this one has been around my garden for three years or so. Research has informed me that the bloom spike could be 15 feet tall (!) and indeed tequila is made from this plant. I love the color and texture of the Agave, a glaucous blue green with chocolate brown spines. A friend of mine grew this Agave and gave it to me with a warning ‘some people are allergic to the spines so be sure and cut them off the tips of the leaves’. Well, I decided to move the thing having put it in the wrong place and thought I had cut off all the spines. Later I found myself in the doctor’s office drawing a picture of the plant for her (she couldn’t figure out what could cause such a horrible bruise and reaction) and getting a prescription for Steroids. Yes, I am one of the allergic. 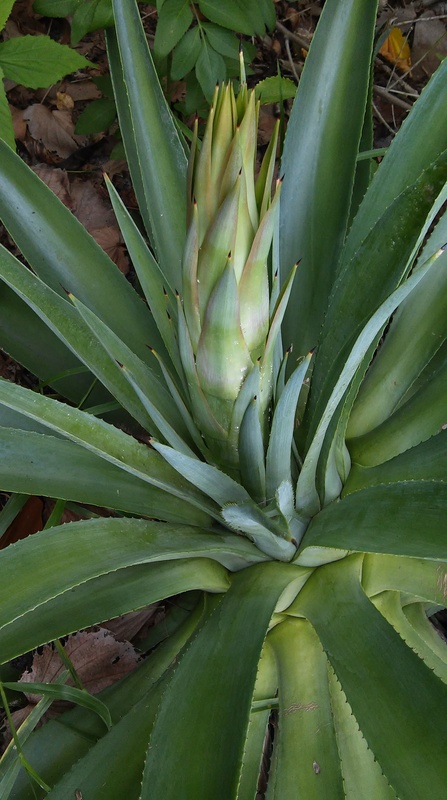 Given my lack of fondness for steroids and the fact that after the Agave americana flowers it dies – I believe it will be asked to leave the garden and I will replace it with a similar sized Bromeliad or Crinum or something lacking chocolate brown spines. 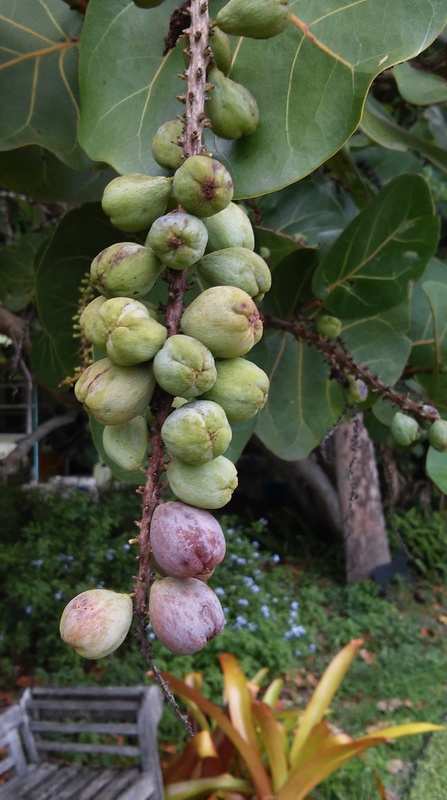 These are Sea Grapes, native to the beach and a bit beyond. The natives like to eat them, the bottom two are nearly ripe but, I haven’t really developed a taste for them and the seed is big. Mine go to the raccoons and birds. 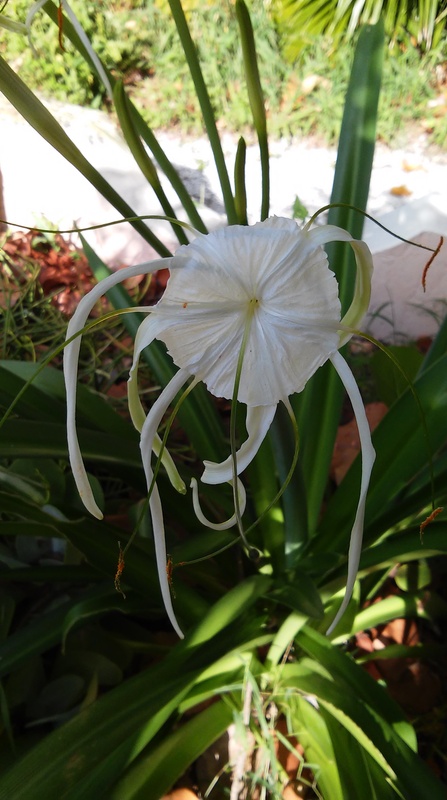 Natives of Florida call these Spider Lilies, I have seen other Hymenocallis called Peruvian Daffodils, clearly I am not in Peru. This is another Florida beachside native- these are easy to grow, but difficult to photograph. The anthers are very like Oriental Lilies, but hard to see. White flowers bloom in clusters, timing is staggered. These are interesting flowers and nearly indestructible. My plan is to relax with the Greyhounds and await storm news, not eat any Sea Grapes or get stabbed by an Agave. A glass of Chardonnay, no Hurricanes or Tequila in my future, hopefully. This entry was posted in hurricanes, native plants of the treasure coast of florida, Treasure Coast Living and tagged Agave americana, cold weather, Dogs, Florida gardening, Gardening, hurricanes, native plants for florida, South Florida Gardening. Fingers crossed that Hurricane ‘Danny’ turns out to be just ‘Danny Boy’ 🙂 I hate the little spines on those agave: I’m not allergic to them, but even so, they sting for hours! It looks like the greyhounds have already been on a tequila binge of their own. All you needed was a clever meme, two empty bottles placed strategically next to the dogs and you could make that image viral!!!!! The viral dog party meme? I think chicken broth shots would be popular. The dogs were working on the El Nino concept and got bored… I hope to get a 15 foot tall flower out of that Agave. I learned some new information from you today. I never heard about the agave spikes. I am also watching Danny. I learned about those spines the hard way. I bruise easily and I think that is the worst bruise I have ever had. I am hoping the dry air will lead to Danny’s demise. I love this post. Witty, fun and informative at the same time. That first paragraph is a keeper! Congrats on the Agave flower. And wishing you a merciful hurricane, if there’s such a thing. Thank you, I think the hurricane is going to be gone soon and PR needs some rain, I am watching the Agave.. Dangerous places gardens. I had to have a course of antibiotics earlier this summer after something in the garden caused my leg to become alarmingly infected. I don’ t even know what it was. Who knows what is lurking out there? Well at least we don’ t have snakes, I’ d never go outside if we did. And as you probably have heard: ‘In Hertford, Hereford and Hampshire, hurricanes hardly hever happen…’ That goes for Suffolk too. I do hope Danny wasn’ t too destructive. Giving hurricanes names makes them sound cute and friendly. They must be terrifying though. Thrilling about your flowering Agave. Indeed gardens are dangerous places and these tropical plants are peculiarly spiny..one of my dogs has an infected toenail from something now. I have not heard the hurricane saying above, I wasn’t aware the UK even could get hurricanes because of the cold water? Nor’easters? Although Danny blew out we now have Erika and they are saying Canada could be in danger or Florida, who knows??! I found a new snake yesterday, ring necked black snake – black with a red band around its neck. Not poisonous and a good snake, so I am OK with him or her living in the front garden. I am interested to see what that Agave does.